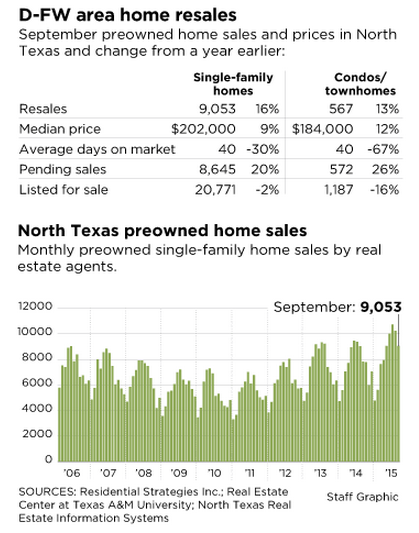 ​​​ DALLAS-FORT WORTH - North Texas home sales were up 16 percent in September as property purchases saw more increases from 2014 levels. Real estate agents last month sold 9,053 preowned houses in the area. That brings the sales total for the first three quarters of 2015 to almost 74,000 purchases — a new record for North Texas. Median home sales prices jumped 9 percent from September 2014, according to data from the Real Estate Center at Texas A&M University and the North Texas Real Estate Information Systems. So far this year, median home sales prices are more than $200,000 — up 11 percent from 2014. With the shortage of preowned houses on the market, builders are scrambling to add to supply. In the third quarter DFW area home builders started more than 8,000 houses — an almost 22 percent increase from third quarter 2014, according to Dallas' Residential Strategies Inc. Builders sold 6,811 new houses in the third quarter, 16 percent more than in the same period in 2014. Only 3,359 vacant new homes were available in the DFW area at the end of third quarter.